One day, many years ago, a beloved pastor was leaving his church to pastor another church in another town. And so, this vacating pastor titled his last sermon, “Stay in the Race”, which was an encouragement to…stay in the Christian Race, and not give up nor give in to worldly lusts and pleasures. Yes, Paul was definitely striving for the mastery, as this above passage reveals! 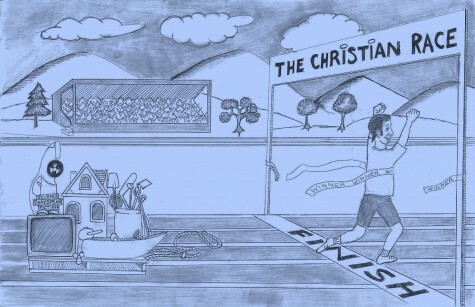 Let’s just take one aspect of the Christian life, and see how it plays a part in running the Christian Race. Let’s take the subject of music, and what is the best music for those who are running the Christian Race. WORDS IMPORTANT, BUT NOT MUSIC? 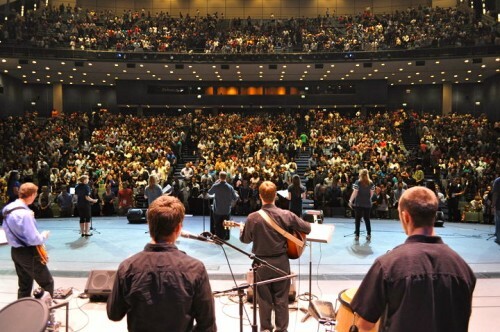 Now in today’s Christian community, there are different music genres to choose from. And there are those who say that as long as the lyrics are in harmony with Scripture, the particular genre doesn’t really matter. But the problem with this thinking is that music is a language all to itself! Without any lyrics, music conveys thoughts all by itself. For instance, one would never play marching music while enjoying a candlelight dinner. Nor would soft violins be played for an army marching into battle! The fact is, it is no big secret that we are living in a very sexualized society. And much of the music today is very sensual. And all too often, Christian lyrics are added to sensual music…One noticeable technique heard in much of today’s Christian music, is when the vocalist pushes air through his or her voice to achieve a sort of, “sensual bedroom voice”. And so, in such cases, there is no attempt to imitate Christ, but merely to imitate the world! In this above verse, the Lord was commanding Jeremiah to purify his life from all the worldly trappings which the people of his day had embraced. And if Jeremiah faithfully put away all such compromising elements from his life, then God would speak through him in his ministry. And of course, Jeremiah was obedient to this charge. Those who are true worshippers of God, are indwelt by the Spirit of Holiness. And so, that Spirit of Christ within will gently prompt that Believer towards a Christlike lifestyle. And there will be a constant desire to become transformed into Christ’s likeness. And day-by-day, the Believer will be increasingly desirous to put away all commonness and worldliness out of his or her life. To let Christ’s light shine out to the world will be the great longing in a Believer’s heart! So also, the Believer will have an inner prompting to be holy, even as Christ is holy. After all, the Holy Spirit is just that: the Spirit of Holiness! And so, that Spirit of Holiness burns as a spiritual fire within the Believer, causing him or her to gravitate toward an ever-increasing level of holiness. Therefore, it is no big surprise that the Believer’s life will take on a greater closeness to Christlike holiness. And this will be seen in the various areas of the Believer’s life. Thus, the music which the Believer listens to will more-and-more reflect the musical tastes of Christ, since Christ is supposed to be living out His life through that Believer! And for those of us who have grown up listening to the raw and carnal music of the world, there will be seen a metamorphosis to a music genre which the world would not touch with the proverbial, “ten-foot pole”. But this should not surprise us. After all, our life has been dedicated to surrendering our selfish and carnal nature to Christ, so that His holiness will replace our former carnal desires. Jesus Christ made no attempt to imitate the world. He and His disciples sang a hymn. But there was no self-exaltation in the various voices. Humbleness made the chorus beautiful. On the other hand, it was Lucifer who exalted his vocal talent, as he sang before the angelic choir. But the really wonderful Good News is that every true Believer rejoices whenever he or she can lay down some cherished idol on the altar for Christ! But just the opposite to that is the striving for earthly attainments, which is the predominant sin of today’s church-world. But with each and every spiritual sacrifice, the more that the Christian’s life will reveal that Christ is living within! And his or her godly example will be an inspiration to others, as they behold their changed life! Almost All Is Vanity! Part 4: It’s A Mad, Mad, Mad, Mad World!